Sega celebrates the impending release of Sonic Colors in New York City tomorrow evening with an ice skating party in Bryant Park. Need a reason to care? How about free hedgehog hats? The first 300 guests to arrive at the Sonic Colors launch party at the at Citi Pond at Bryant Park in New York City tomorrow evening will skate away with a fancy free Sonic the Hedgehog hat. You know, the fancy ones you can normally only get by preordering the game at GameStop. Preorder Sonic Colors for the Nintendo DS or Wii from GameStop, and you get this hat. 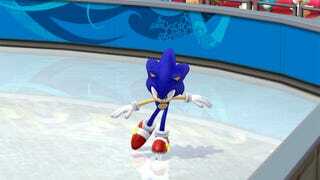 Snugly wrapped in their hedgehog headwear, those 300 party-goers will also be able to skate for free, while listening to a live performance of the game's theme song "Reach for the Stars" by the band Cash Cash. Come on, sing it with me! "I'm gonna reach for the stars, although they look pretty far!" Brilliance! Fans will also be able to play the game two weeks ahead of its November 16 release. "We are extremely excited to allow fans to play Sonic Colors two weeks before launch" said Judy Gilbertson, Senior Brand Manager of Sonic Colors. "We're delighted with the quality of Sonic Colors and the passion that both fans and press are showing for the game. This party is our way of thanking everyone for supporting us as we prepare for the release of the most exciting Sonic game in recent memory." The event runs from 6PM to 10PM Eastern time, so be sure to get their early or bring your own damn hat to stay warm on the way home.